Also known as Tom Thumb Black Velvet, these strikingly unique Dwarf Nasturtiums are lovely to behold! Nearly black, these deepest of red blooms offer amazing depth of color, offset by familiar yellow throats. 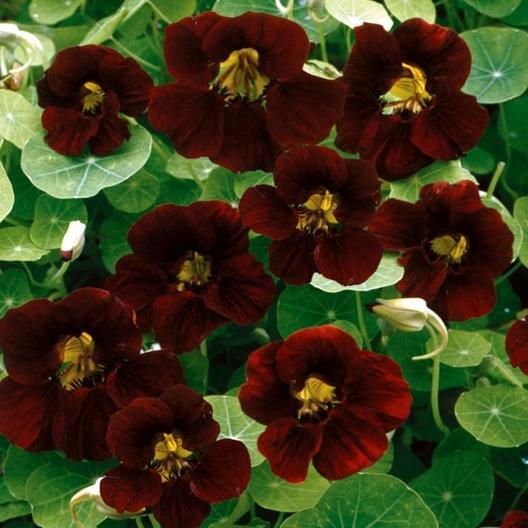 A prolific bloomer, gardeners can enjoy Nasturtium Black Velvet all throughout the spring and summer. Be sure to soak your Nasturtium seeds overnight (about 12 hours) to help seedlings break through the tough outer shell.